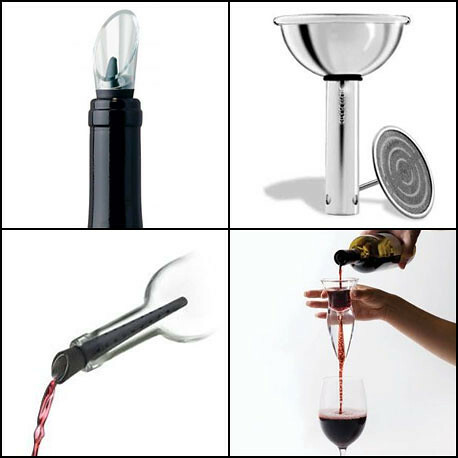 Wine Aerators are small tools that aid the aeration of wine while it’s being poured. The reason for their use is to basically make the wine taste as best as possible by exposing as much of it to oxygen as possible. You’ll find that some wines, especially recent vintages, will be very ‘closed’ which means that they’ve not fully developed and are not releasing all the aromas and flavours as a more mature wine would. The process of pouring the wine through a wine aerator into a glass or a decanter encourages the wine to ‘open’ up more by the exposure to oxygen and you should notice a remarkable difference in the aroma and taste if you care to leave the wine in its’ receptacle for a while after pouring. Swirling or agitating the wine within the wine glass or wine decanter prior to resting will also enhance the results. Some wines may be very tannic or very powerful in flavour, so much so that aerating will hopefully soften the wine enough to make it approachable and good to drink. If this type of wine was simply just poured into a glass you may find that it would need to be left for a considerable time before it’s pleasant to drink. This isn’t always the case and it may be just that the wine needs longer to mature in the bottle before it is ‘ready’ to drink. Wines continually change after being bottled and this is the simple reason for aging wine. The best way to test this for yourself is to buy a case of a dozen bottles, for example and then open and try a bottle every now and then and gauge the development over the time that you’re drinking them. You’ll eventually come to try a bottle that doesn’t taste quite as good as the time before and that’s normally a good sign that the wine has just ‘peaked’ and the rest should be drunk. Some wines that have aged for a considerable time will also develop some sediment and occasionally some slightly off putting initial aromas upon opening. If a wine aerator also has a built in filter this should help in both instances. The filter will help separate the sediment from the liquid and at the same time allow the oxygen to get to the wine and give the built up ‘off aromas’ a chance to dissolve into the atmosphere and thus leaving the good smelling wine behind for you to enjoy. Wine aerating funnels and other associated wine accessories are a personal thing and many people have their own views and opinions over their effectiveness or their necessity. I am of the firm belief that they definitely assist in the aeration and the enjoyment of all red and white wines, however young or old, fortified or otherwise and I will always use some sort of device to assist in the aeration process should there be something available on that occasion. Many wine funnels and wine aerators are inexpensive in relation to the job they do and together with other related wine accessories make ideal wine gifts for the wine connoisseur or the wine enthusiast alike.